The Reno and Sparks area is home to some amazing restored cars. The famous Hot August Nights celebration keeps our community excited about vintage restored cars and the process of car restoration. DIY car restoration can be a long process, but at Liberty Collision we can help prepare you to restore your car! 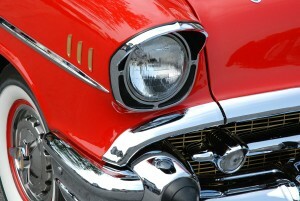 Car restorations vary depending on the type of car. You may want to restore your car for different reasons. The level of your car restoration will determine how much time and money you will be putting into your vehicle. Driver restoration involves getting a car fully functional so you can safely drive the vehicle in public. You can also include some minor cosmetic car repairs in a driver restoration project. The other levels of car restoration involve a lot more cosmetic work: street show, show car, and concours. If you want to show your car on a professional or competitive level, these car restoration projects will require significant amounts of body work and cosmetic repair. A car restoration project is a big undertaking, so you will want to prepare your shop area before getting started. 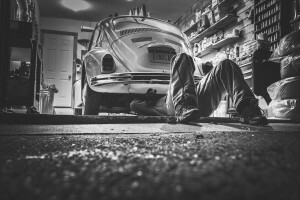 Make sure your shop or garage allows you enough space to work on your car, especially since the car will stay parked for awhile during your project. A two-car garage provides enough space for this type of work. DIY car restorations will take longer, but many people enjoy car restoration as a hobby! Your shop needs to be clean and dry before and during your car restoration project. Your DIY car restoration may involve some hazardous chemicals, so keep an oil drum in your shop as you work. Once you have completed your restoration, make sure to dispose of any hazardous chemicals properly and safely. A car restoration is a project that requires a lot of time, skill, and tools. If you want to restore your car on your own, make sure you have enough tools to take care of your car. Car lovers who spend a lot of time working on fixer-uppers can have hundreds of tools for various car repairs! Many car restorations involve taking the pieces of a car apart and tending to them individually before putting the puzzle back together. Consider taking pictures of the car before dismantling anything. If your car restoration plans require you to take parts of your car apart, create a system to keep track of which car part goes where. Use plastic bags and sharpies if you must, but you will want to make sure everything is labeled for a seamless reassembly. Another big aspect of a car restoration project is the budget. Your budget is a good place to start when it comes to new parts and the amount of hours you are willing to spend on your vehicle. Sit down and work out your budget before you start buying parts and tools so you know what your limits are. There are so many steps to a car restoration. How can you keep track of everything that has been completed or still needs work? Use a car restoration checklist! Add any details that are specific to your car’s make and model. This simple yet effective tool can be a real lifesaver for projects like these. Bring your car to our highly trained team at Liberty Collision to restore your car. At Liberty Collision, our team of technicians is devoted to getting your car up and running on the road safely. From cosmetic car repairs to functional bodywork and repairs, we can help you restore your car. Visit us at Liberty Collision today!